As northern New England's cultural hub, Portland, Maine, has become a showcase for artists, musicians, craftsmen, and actors. This charming coastal city routinely appears on lists of America's best places to live, visit, dine and play outdoors and is also an increasingly popular port of call for cruise ships. Portland and nearby towns in southern Maine are also a mecca for outdoor enthusiasts and fans of spectacular scenery. If you're looking for memorable things to do, here's your guide to some of the best attractions in Portland and southern Maine. Want to taste the freshest lobster of your life? Catch it yourself! In Portland, you can board an authentic lobster boat with a real Maine lobsterman and venture out into scenic Casco Bay, where you'll learn how to bait and haul traps. Lucky Catch Cruises depart from Long Wharf several times daily from the first weekend in May through the last weekend in October. The luckiest part of your adventure is the opportunity to buy the lobsters you caught at discounted, wholesale prices. Portland Lobster Company, located across the street from the dock, will cook your catch and supply the butter. The Maine coast has more than its fair share of New England's lighthouses, and when you visit the state's largest city, capturing your own images of storied Portland Head Light should be on your must-do list. George Washington was president when a beacon was first constructed on this dramatic ledge. There's a museum in the former keeper's quarters, built in 1891 that you'll want to visit: It's open daily from Memorial Day through October and on a more limited schedule starting in late April and through the end of December. Allow plenty of time to explore historic ruins in adjacent Fort Williams Park. There are five more lighthouses within an easy drive of Portland, so make a day of photographing these inspiring guardians of the Maine coast. Portland is one of the country's top burgeoning culinary destinations, so no visit would be complete without a reservation at one or two of the city's hottest restaurants. Head to farm-to-table favorite Fore Street For wood-fired delicacies served in a chic warehouse atmosphere. Nearby, hipster-haven Eventide Oyster Co. is a safe bet for some of the freshest raw bar picks in town, plus a repeatedly lauded, inventive take on the lobster roll. View the outstanding collection of American, European and contemporary paintings and other works at the Portland Museum of Art, Maine's largest and oldest public art museum. In addition to its permanent collection, which includes many Maine masterworks among its highlights, the museum hosts special exhibitions and events throughout each year. Winslow Homer's restored studio is the museum's most unique holding. Reserve a spot on a small group tour bus tour to this Prouts Neck, Maine, landmark, where you'll see scenes that inspired Homer's dramatic marinescapes. This seaport city's waterfront warehouses and cobbled streets that mariners have trod for centuries now beckon to shoppers. Downtown Portland's Old Port District has been reimagined as a retail hub, and you'll delight in exploring shops and galleries with distinctly Maine flair. Don't miss Sea Bags, where the totes are made from recycled sails. 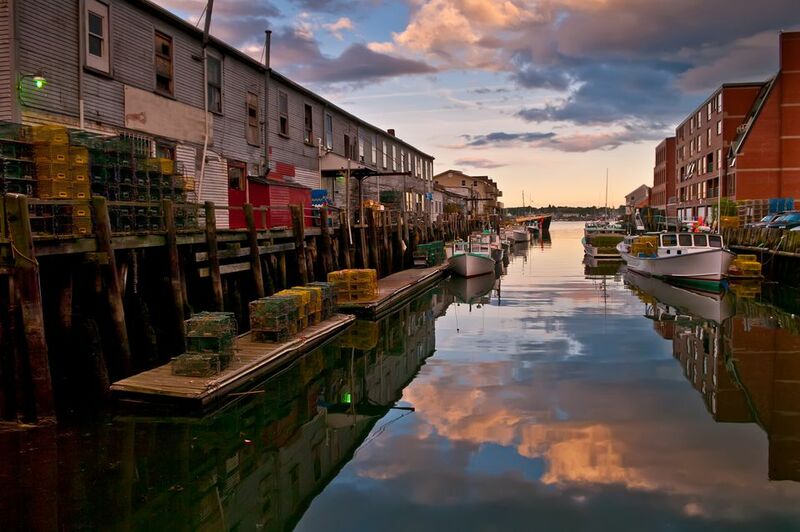 And be sure to stop into Harbor Fish Market, even if it's only to drool over the bounty of Maine's waters. Climb aboard an antique fire truck for a memorable look at Portland's neighborhoods and attractions. Portland Fire Engine Co. offers the city's coolest tours, narrated by locals who not only share historical tidbits but the inside scoop on a city they love. In just under an hour, you'll have a good feel for the city. The fire truck stops for photo ops, and a multimedia presentation adds to the experience. Tours depart from Commercial Street in front of the Portland Lobster Company from late April through late October. Hundreds of isles dot Portland's storied waters, and Casco Bay Lines provides ferry service to the major islands. Far more than a year-round transportation company, the ferry line's schedule includes scenic cruises including sunrise and sunset excursions and music cruises featuring local bands and dancing. One of your best options is the 15-minute voyage to Peaks Island, where you can rent a bike and find quiet beaches, casual dining and one of Maine's quirkiest attractions: the Umbrella Cover Museum. Casco Bay Lines is also famous for its mailboat runs. That's right: You can see the sights as this working boat delivers island dwellers' mail. Portland's minor league sports teams have loyal followings, and going to a game is a fun, affordable activity for families. Cheer on the Maine Mariners hockey team at Cross Insurance Arena or the Portland Sea Dogs baseball team at Hadlock Field or the Maine Red Claws basketball team at the Portland Exposition Building. You'll feel close to the action, and frequent promotions add to the excitement. Team logo wear makes a perfect souvenir or gift for friends back home. Portland is an architecturally interesting city, which was largely rebuilt in Victorian style following a devastating 1866 fire. One of the city's first brick buildings not only survived the blaze, but it also became Maine's first historic house museum in 1901. If you're a literature fan, you'll want to be sure to tour the Wadsworth-Longfellow House, where influential poet and famous Portland son Henry Wadsworth Longfellow spent his childhood. For a glimpse of lavish living in the city, visit another Great Fire survivor. Step back into the Victorian Age on a guided tour of the beautifully furnished Victoria Mansion, which was the most expensive home ever built in Maine at the time it was completed in 1860. Both houses are open for tours May through October. Victoria Mansion also reopens for special holiday tours from late November through early January. Portland is Maine's top culinary destination, and there are so many restaurants, bakeries, breweries and gourmet food producers competing for your stomach space, you may find choosing where to dine and imbibe your trip's biggest dilemma. Enter Maine Foodie Tours: their Portland walking tour is an efficient way to sample some of the Old Port's most delicious dishes and treats. Over the course of three hours, you'll taste everything from chowder to chocolate truffles made with Maine potatoes and sip craft beer and Maine honey wine along the way. Plus, your guide will share an insider's perspective on the food scene that will help you plan meals for the rest of your stay. Small group tours leave from the Old Port Wine Shop on Commercial Street year-round. Portland's 350-year-old Eastern Cemetery is brought to life by devoted guides during Spirits Alive tours available Wednesday, Thursday, Saturday or Sunday from July through mid-October. Once neglected and badly vandalized, this historic landscape has been resuscitated and transformed into a city attraction. You'll especially appreciate the artistry of 700 headstones etched by local stonecutter Bartlett Adams. If you're visiting Portland during the Halloween season, don't miss your chance to Walk Among the Shadows, bumping into ghostly storytellers. Just outside of downtown Portland in Yarmouth, Maine, there's a free attraction that will allow you to say you've seen the whole world in a day. Eartha is the world's largest revolving globe, and as this marvel spins, you'll feel a new appreciation for Maine's place on the planet. Eartha occupies the lobby of Garmin, which purchased the massive globe's innovative creator: DeLorme. A condition of the sale was that Eartha ​remains open and free to the public. You can visit any weekday year-round. Psst! Want to hang out at a cool speakeasy while you're in Portland? Make sure you have cash on you because that's all they accept at Lincolns, where all drinks cost a Lincoln. That's a $5 bill: Get it? Dimly-lit and with a local vibe, this basement bar has a secret entrance at 36 Market Street, and once you find it, whatever you do: Don't photograph it. Comedy and open mic nights are the best times to go. If it's your first time trying to find your way in, an Uber driver may be your best tipster. Portland is a walking city, with scenic trails perfect for combining sightseeing and exercising. Take a stroll along Casco Bay on the Eastern Promenade Trail, or walk the one-mile perimeter trail on Mackworth Island, offering views of Portland and the islands of Casco Bay. In addition to these pinnacle walks, the non-profit Portland Trails organization maintains and promotes the use of 70 miles of trails and open space in the city. Treat wee ones to a memorable adventure at the Children's Museum and Theatre of Maine in Portland, where hands-on exhibits—including a lobster boat, farmers' market, space shuttle, ranger station and tidepool touch tank—will fascinate and entertain them. There are even dedicated areas for toddlers, so it's the perfect first museum experience for the tiny set. Take in a spectacular star show or laser light display at the University of Southern Maine's Southworth Planetarium, too, and you'll be as enthralled as your children. If you're a theater fan, you'll want to see what's on at Portland Stage. Maine's largest professional theater company produces seven mainstage shows annually and also stages new and experimental works and hosts talks and other events. The Portland Players, Maine's oldest community theater company, also presents engaging performances during a season that includes drama, comedy, and musicals. Check the schedule at John Lane's Ogunquit Playhouse, too. This summer theater venue, located south of Portland in Ogunquit, is renowned for its high-quality Broadway musicals.